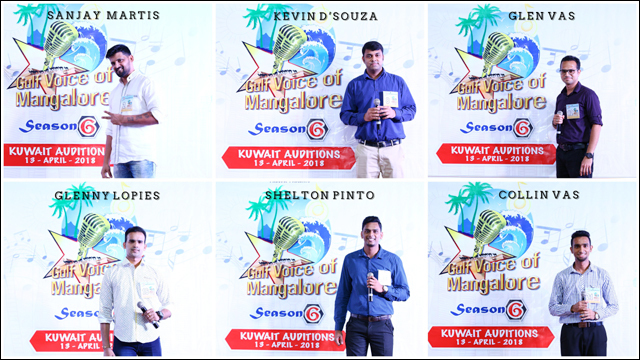 Kuwait, Apr 14: The success of the mega Konkani singing talent hunt show ‘Gulf Voice of Mangalore’ during the last five seasons has created waves in Kuwait and once again ‘Kuwait Canara Welfare Association’ (KCWA) organized the audition rounds of ‘Gulf Voice of Mangalore Season 6’ (GVOM) on Friday April 13 at the Indian Community School Kuwait, Khaitan. After the final registration process, the event started at 4:00 pm with prayer lead by Sunita Dsilva, which included a moment of silence for GVOM founder late Louis Rodrigues. Rita Rodrigues and GVOM founder Lawrence Pinto were among the attendees in the audition. KCWA president Hilary Stevan Rego then extended a warm welcome to the audience and contestants. 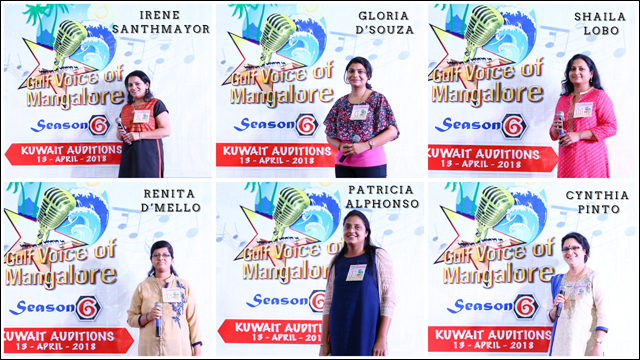 Judges for the day’s competition – Kuwait’s professional musician and trainer Joe D’souza and singer, composer and music teacher by profession Gladys Noronha and evergreen musician of Salmiya’s Ave Maria Choir, Jacqueline Alphonso, were introduced by Anil Fernandes. The judges were then escorted to the dais and presented with flower bouquets. The president handed over the judges mark sheets to the judges and Orson D’Souza– coordinator for GVOM Season 6 briefed the audience and contestants about the competition rules, format and judging criteria. The competitions were held separately for female and male contestants. The numbering sequence was decided by taking lots in presence of audience. Male singers were chosen to sing first followed by female. Compere Anil Fernandes thanked all the musicians for their voluntary service in training, practicing and playing guitar. Kuwait’s well known guitarist Joy Fernandes played guitar to most of the contestants voluntarily, as he has been doing in the previous 5 auditions of GVOM. His service was extended to such a level that out of 42 contestants, he has trained and played guitar for 27 contestants. Harry Fernandes proposed vote of thanks. The programme was well compered by Anil Fernandes. Joyston D’Souza. Joy and Roshan captured the event with their skills in photography and Alban D’Souza did the videography. Waves Events & Rentals provided the sound system. Promotional Audition posters were created by Reema Lobo and the videos by Glen Fernandes. KCWA also thanked Season 5 Winner Joyline Gonsalves and Season 4 Winner Morvine Quadros for promoting and encouraging the budding talents to take part in the auditions. These selected 12 singers from the preliminary rounds will be competing in the semi-finals which will be held on Friday, 28 September from where one each successful contestant from male and female categories will be chosen to compete in the grand finale which will be held in Kuwait to hunt for the coveted title, along with ten other contestants from Oman, UAE, Bahrain, Saudi Arabia and Qatar. The grand finale will be held in Kuwait on 9 November.